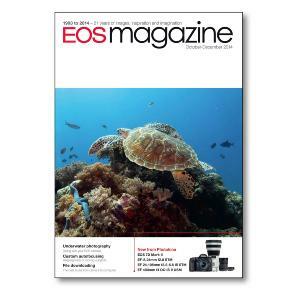 Add this issue to your photographic library for information on Canon's latest EF, EF-S and EF-M lenses, articles on underwater photography, custom autofocusing and much more. Canon news and freebie - Details of Canons new products and Photokina feedback. Canon's 80th anniversary - Kwanon, Japan's first local plane shutter camera. Landscape masterclass - David Taylor captures the British Countryside. New EOS camera and lenses - Full details of the EOS 7D Mark II camera and three new lenses. Me and my camera - In a new series, we talk to an EOS subscriber about their photography. Custom focusing - Customise the behaviour of your camera's autofocus system to match your subject. Two minute technique - Take a few minutes to experiment with one of your camera features to see what you can do. File downloading - We explore the various methods of transferring images from your camera to your computer. Super-wide exploration - Tom Sheppard was one of the first to try out Canon's EF 16-35mm f4L IS USM wide-angle lens. Underwater world - Aaron Gekoski offers tips for budding underwater photographers. LCD evolution - The liquid crystal diplay has played a key role in the digital photography revolution. How was it shot? - Creating a splash with flash. DPP version 4.0 - Our first impressions of the recent major upgrade to Canon's Digital Photo Professional software.